I come from a long line of bakers and have become increasingly health-conscious and nutrition-focused in food preferences. 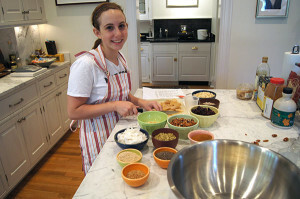 When my daughter Sasha suggested I bake up granola, a recipe search turned up ingredient lists with lots of grains flavored with refined sugars and saturated with oils. I knew I had to come up with something new and different. To increase the nutrition value and decrease empty carbs, I lowered the proportion of grains, built up the quantities of dried fruit, nuts and seeds, and selected smaller amounts of natural, flavorful sweeteners. I selected organic protein-rich grains. And I wanted a strong taste experience so I added one of my favorite dried fruits, crystalized baby ginger! A beautiful syrup of Maryland Maple Syrup (Steyer Brothers) and caramelly-coconut palm crystals with a bit of Canola Oil, cinnamon and a good shake of kosher salt harmonizes the select ingredients. Hand-cut chunks of whole walnut and pecan halves compliment the hearty dried tart Michigan cherries and Jumbo Flame raisins. A superfood base highlights flavor, color and texture: pumpkin and sunflower seeds, almonds, chia and flax seeds (to learn more about the value of nuts in a healthy diet and for weight control, click here). Nuts, fruits and grains are mixed with the lightly-sweetened and spice-infused syrup. Then the whole batch is slowly roasted to toasty, chewy perfection! And WOOT!Granola is vegan and wheat free! Sasha shared it with her friends and I began to serve it alongside our wine and cheese offerings when entertaining. Friends and family repeatedly requested the mix, and then urged me to bake enough to sell. I gifted a bag, along with my husband’s homemade bread, to a special friend, Irena Stein, who is a marvelous chef, caterer, and restaurateur, when she went to visit her daughter and newborn grandchild. Irena exclaimed she had had not anything like it and it was a must to share with the community! I baked away and began selling by word of mouth and at Union Graze Farmer’s Market, Azafran Café, Waverly Farmer’s Market, Fells Point Farmers Market, The Emporiyum, and various community events. Wonderful small grocers, cafes and markets including Eddies Charles Village, Eddies Mt. Vernon, Dovecote Cafe and Rooster and Hen Store, John Brown General and Butchery and Park Cafe and Coffee Bar help me bring WOOT!Granola to Baltimore. From the first bite to the last, the flavor is rich with copious amounts of fruit, nuts and seeds. W00T! is granola but with so much more taste, energy and pleasure. Bringing W00T! to the table will make you the hero of your family’s and friends’ next breakfast, brunch or party! Bringing new and old friends together with W00T!! is exciting! Enthusiastic responses foster my desire to bake, experiment and develop W00T! for food lovers to savor. Finding a local ingredient, such as the Maryland Maple Syrup produced for over 100 years by the Steyer family in Garrett County, is a treasure. An added bonus is meeting local purveyors of ingredients, delicious and distinctive foods and drinks, and learning as I go. Baltimore is a great community town and I am honored to work with farmers, cooks and chefs who create wonderful Baltimore foods and the curious, avid diners who enjoy them. 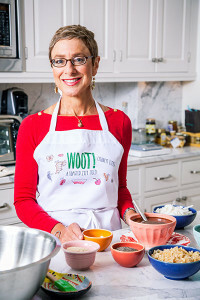 I began baking in my home with my family and they have been an essential ingredient to W00T!’s success. My family tests recipes and helps to prep and pack W00T! No aspect of W00T!! production is mechanized and the nuts and dried fruits are cut by hand with consideration for perfecting the shapes and textures of W00T! ingredients. My daughter Leah has helped with sales and prep, and Sasha designs W00T!’s playful and appetizing graphics. My husband Jonathan labels and wraps bags with precision. It is a family affair! We now bake at B-More Kitchen, the fantastic new food incubator in Baltimore. We continue to prepare WOOT! by hand to maintain the high quality of the chewy, crunchy, spicy, salty and sweet mix. We are developing new mix combinations and will be bringing a spicy Latin Mix with Jalapeno and Cayenne Pepper and Tropical Fruits and Nuts, and a Coffee Cacao that packs a great caffeine-infused Mocha punch to you soon! After being out of the work force ( I developed museum exhibitions at the Smithsonian, US Holocaust Memorial Museum, Maryland Historical Society and US Botanic Gardens), baking W00T! has been a great new direction and challenge for me. 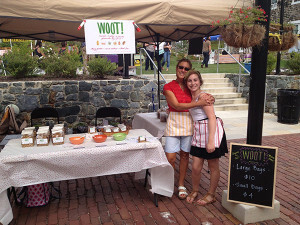 Learning about the community, new foods, local purveyors and events, along with meeting new people and enjoying lots of positive feedback make W00T! a great Small Batch adventure!